A week prior to the MJC Carrion Halaalizer’s investigation and announcement, we were informed of the ‘Halaal’ Pork item sold by a Pick ‘n Pay store in Cape Town. 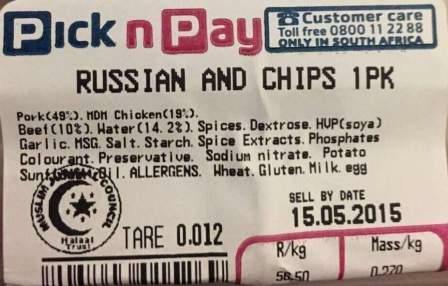 We had refrained from immediate comment since the label did not bear the name of any particular Pick n Pay store. Fabricating a label by means of computer is too simple an exercise. It was therefore only prudent to await further developments in this haraam debacle of ‘halaal’ pork and ‘halaal’ carrion which have become almost staple foods for a miscreant community whose Imaani inhibition to haraam junk food and carrion has already been extinguished as a consequence of carrion addiction – a satanic addiction for which the devil molvis and devil sheikhs of the Carrion Halaalizing outfits of moral corruption and Imaani destruction are primarily responsible. The MJC’s stupid pleading of ‘labelling error’ and Pick n Pay’ insipid and hollow apology are standard procedure for pulling wool over the eyes of a stupid carrion-consuming public. The same stupid and monotonous explanations have been tendered over and over again in the recent past when ‘halaal’ pork discoveries were made by members of the public, and not once by the so-called inspectors and supervisors of the Carrion Halaalizing outfits or by the so-called ‘Muslim’ managers in charge of the haraam carrion stores. The first reckless haraam act for the sake of the boodle is the halaal certification granted to kuffaar stores. This haraam treasonous act has desensitized Muslim inhibition to haraam meat products. The meat acquired from kuffaar hands no longer matters. Whether it is halaal or haraam is of little significance. Muslims are so addicted to devouring carrion certified as halaal that the halaal logo/stamp is now a meaningless superfluity. It graces even pork products, not only in South Africa, but even in Muslim countries. In fact, in Muslim countries the situation is more deplorable than in South Africa. Despite the MJC’s Muslim female manageress, the Muslim store manager, the full-time monitor and the MJC’s inspector who calls once a month, they failed to detect the ‘error’. If it was not for a diligent buyer, no one would have known. In fact, every such irregularity was brought to the fore by customers, never by the MJC’s or SANHA’s carrion staff. The ‘halaal’ pork, be it an error, is another addition to the filthy haraam track record of the MJC’s haraam carrion scandals. These carrion outfits have no fear for Allah Ta’alal. Their belief in Allah Ta’ala is questionable. They halaalize kuffaar meat products with shocking audacity – MJC, SANHA, NIHT, ICSA, etc. – the whole lot of these miserable specimens of humanity, are the vilest of creatures in terms of the Shariah. Their calcified hearts have no room for conscience. The haraam boodle they are sucking from the haraam trade has made them blind. They do not believe that there is a Reckoning tomorrow in the Divine Court. They perhaps do not believe that they will ever die. Whilst Maut is stalking them and the Qabr calling them, they recklessly pursue the haraam boodle with their carrion-halaalizing shenanigans. While the money has corrupted the brains and hearts of the Carrion Halaalizers, the Muslim public has to bear greater blame for this sordid filth and mess of carrion which Muslims are devouring. Carrion is lawful for only shaitaan and his progeny. It is not halaal to give MJC-SANHA-NIHT-ICSA certified maitah to even dogs. Yet, Muslims are devouring it. Indeed people have descended to levels lower than even vultures. Besides shaitaan and his progeny, we believe that only vultures devour carrion. But, due to the halaalization industry operated by the MJC, SANHA, etc., human beings too have joined the devils, and vultures in carrion-consumption. It matters not what and how many ‘corrective’ measures are instituted to curb the haraam irregularities. It is not possible to effectively police and control the haraam operations of the kuffaar business establishments. The ‘corrective measures’ instituted by the MJC are mere window-dressing to befool the stupid public whose Imaan is in a state of deathly hibernation as a consequence of years of carrion addiction. Only those who have absolutely no concern for halaal and haraam matters, will consume meat products acquired from kuffaar stores. No amount of advice and admonition will ever benefit Carrion Halaalizers. They understand only MONEY, and they crave for haraam money. As long as the haraam boodle comes their way and fills their pockets, the community can go to Jahannam. But tomorrow when they are apprehended by Maut, this paralysis which is gripping their brains and which has destroyed their hearts will dissipate and the reality will become crystal clear. But then it will be too late. May Allah Ta’ala save the ignorant masses from these legions of Iblees who feed Muslims carrion.